I was wondering if you could help me with answering some of my questions. Firstly, I'll describe my situation. Right before Christmas last year I stopped running due to extreme pain I endured in my last two runs. I struggled even to walk so I altered my gait to take pressure off the top part of my right foot. I can say that after 5 months I can now walk without pain but that is because I walk without using the front part of my foot and no longer using winter boots as it's warmer. Now I am using Merrell vibram normal shoes which I find comfortable and I can detect which part of my foot that I can use. My second toe on both feet are longer than my big toe. Irregularities seen in 2. Mtp-joint with a few very small subchondrale cysts with basis of prime phalanx. Implied hydrops and small periarticulare deposits dorsally. Suspected a small avulsion cortical fragment from basis of phalanx. Also markedly edema lateroplantar along course of lateral part of the plantar fascia and lateral collateralligaments so could be the state after avulsion of the plantar fascia with a small cortical fragment from the base of prime phalanx. No enhanced intermetarsal bursa, no Morton's nevrom. Normal flexor and extended tendons. Unremarkable sesame bone complex plantate for caput of 1.metatars. Dr. Blake's Comment: Yes, from you image above, the lateral aspect of the plantar plate is torn causing the 2nd toe to drift medially (toward the 1st toe). I have attached a photo of my foot, where toe drifting of the 2nd toe is quite apparent (please excuse the look of my sticky taped toes). I will be meeting with a surgeon in October in discuss options for surgery. In the meantime i have been recommended to use Hoka arachi runners to avoid pain and the ability to walk normally. I have tried a pair on and when I try to walk as normally as I remember I do not appear to have pain. I was wondering, if I should purchase these shoes? If I do, the main reason would be so that I could resume running until my surgery. I tape my toe regularly. I do pronate and have used orthotics in the past but not since my injury. My main question here is, will I cause more damage to my toe if I start running in the hoka arcachi runners , more so than if I wait until the surgery and resume running again then? Dr. Blake's comment: As long as you maintain the 0-2 pain level, you are okay to run. The joint has arthritis starting (all the bone cysts and periarticular deposits), but hopefully the surgeon will clean that out at the time of surgery along with fixing the ligament. There are so many types of surgery for this, it is hard to know. I really appreciate your advice on this matter. This is where it all begins in the doctor/patient or therapist/patient relationship. The time spent here discussing the historical facts of an injury or pain syndrome, and important contributing factors, can be vital in the success or failure of treatment. Why is it so vital? Followup visits work off the success or failure of the treatment plan set on that first visit. If the information collected is inadequate, the entire sequence of events following may be subpar. I refer the reader to a post I did earlier on giving a good history. Please review it now before we go further. 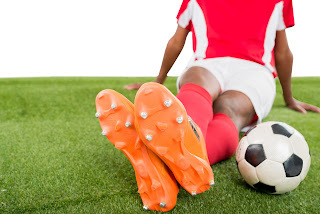 What has your history been of overuse injuries (nontraumatic)? How all or most of your injuries been to one side of your body? Do you have any arthritis from your hips downward and wear? A skilled practitioner knows the relevancy of the answers. The answers will help point the course of treatment in the right direction. The 2 pairs of orthotic devices above are actually the same pair. The patient Luz presented to my office with the pair on the top of prescription orthotic devices. These orthotic devices were not controlling her pronation motion enough, and I felt that some of her symptoms could be caused by this motion. Instead of just making a new pair, I was able to get more stability by teaching her power lacing, and having the podiatry laboratory place extrinsic rearfoot posts (brown) and arch reinforcements (white). This simple solution can be the subtle difference in motion that eliminates pain. This is one example of the art of medicine combined with the KISS principle that I use on a routine basis with great results for patients. These are Chrome Bike shoes with the embedded cleat for bikes. They are the best looking ones I have seen. I use them in almost every treatment plan for chronic plantar fasciitis, or plantar fascia tear. They are also used for many ball of the foot problems that you want to avoid toe bend. 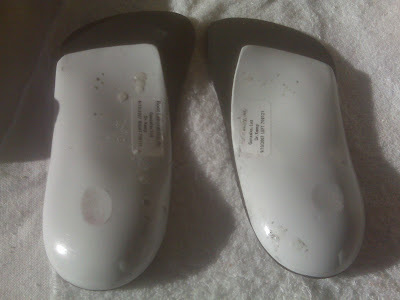 Of course, you should have your orthotics and padding, etc, in the shoes. This was highly recommended by one of my patients as a great way to stretch out the arch and loosen trigger points. How is the correct orthotic device ordered or purchased? The orthotic device that you prescribe, or that you recommend purchasing in a store, may or may not help if it is not the correct type. At its best, the correct orthotic device will successfully make the necessary change in mechanics, but it may still be crucial to work on all the other aspects of rehabilitation (anti-inflammatory, flexibility, strengthening, etc.) in order to relieve all your symptoms. It is important when prescribing the orthotic device that you are familiar with the many different types of orthotic devices available. It is also important for the patient/customer to be somewhat clear on what type of orthotic device is needed. And, unfortunately, the type of orthotic device required today may change in the future with different sports, different symptoms, different shoe types, and different age. You need to be willing to change to a different type of orthotic device if the patient's symptoms are not improving with the present pair of orthotics, and if there is another type available that may help them. Sometimes, practitioners don’t like discussing this type of change due to the added cost to the patient, but it is important that they know there are options. Corrective or Controlling Orthotic Devices do what they say---correct or control excessive pronation or supination (the inward collapse of the arch, or the outside roll of the ankle, respectively). This type of orthotic device produces the most dramatic change in function, and may take the most time to get used to wearing. Stabilizing or Balancing Orthotic Devices normally do not change foot position much, but the patient/customer feels more centered, more balanced. The weight of any point can become so distributed that only a small fraction of the original weight bearing still exists. This can be vital for heel pain, some arch pain, fifth metatarsal base pain, and many metatarsal problems. Shock Absorbing or Cushioning Orthotic Devices take the stress out of the pounding of heel impact. Runner’s versions need to have equal cushion at the heel and forefoot. 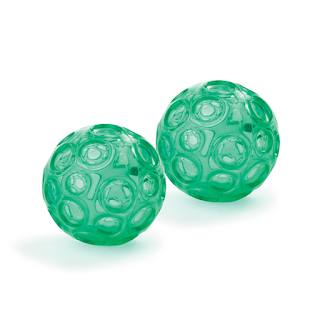 These can dramatically reduce the stresses which cause or aggravate stress fractures, joint pains (knee and hip), and heel pain. One of the best shock absorbing orthotic devices is the Hannaford which will be discussed later. Accommodative or Weight Transferring Orthotic Devices try to transfer weight from a painful area to a non-painful area. These orthotic devices have probably been around the longest of all orthotic devices prescribed by podiatrists. If you have heel pain, you need an orthotic device that transfers weight into the arch. If you have sesamoid pain, you need an orthotic to transfer weight back into the arch and onto the 2nd and 3rd metatarsal heads. Combination or Multi-Functional Orthotic Devices are probably the most prescribed type of orthotic device. The prescribing practitioner attempts to accomplish multiple tasks with one type of orthotic device. This is why there are so many types of orthotic devices out there. When you really study them, most primarily do one of the 4 basic functions really well, and then 1 to 3 of the other functions somewhat or not at all. A good practitioner will try to get the most out of orthotic therapy. This means that the practitioner tries to combine different functions into each orthotic device on a routine basis. Sometimes, however, doing too much sacrificing the most important function. 1. Do I need to order a corrective device to change foot positioning? 2. Does the patient primarily need to feel more centered and stable? 3. Do they need cushion/shock absorption as they walk or run? 4. Do they need to transfer weight from a painful area to a non-painful area? 5. Do they need a multi-purpose orthotic device with many functions to help the problems at hand? 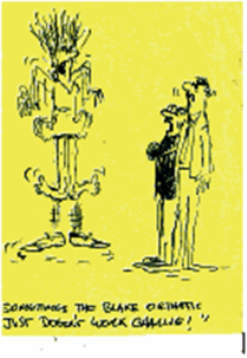 Perhaps the patient will need several orthotic versions since their activities, shoe gear, etc. vary so much. The doctor and patient must be on the same relative page, and the patient must be aware that there may be a plan B. When performing external rotation exercises, which is a great core muscle group, and also very helpful if you excessively pronate, you typically want to avoid putting the resistance down at the ankles and bend the knee. As you get more and more resistance, the torque on a bent knee can be damaging. These 3 versions seem very safe. These videos were highly recommended by my patient. I think we all believe that there are benefits to be gained in yoga. These beginning yoga videos may just be the ticket for us to learn and have it enrich our lives. Start simple and go slow. Namaste (I bow to you)!! Unfortunately, like many of the other readers of your blog, I have suffered a non-displaced medial sesamoid fracture in my right foot in November 2017. Since December 2017 I have been in a walking boot. A few months went by, and after making zero progress I started digging for more information and found this blog along with a bunch of other resources regarding bone health. Even though I knew I was getting more than adequate amounts of calcium each day, I started taking Vitamin D in March 2018 and my symptoms started radically changing, and the injury finally started to feel like it was 'healing'. To confirm my suspicion of low vitamin D, I ordered a blood test myself (via privatemdlabs.com, if any of your readers want to get one done without going to a Doctor) and found out my level was at 26 ng/ml. After finding this out, I increased my dosage, and I have been maintaining it around 50-60 ng/ml for about 3 months. Dr. Blake's comment: Thank you for the info on Vit D testing. Over these last 3 months, the pain has been primarily due to the inflammation and blood flow going to my forefoot, which I have been able to mitigate by keeping my foot elevated and icing it occasionally. I've done a decent job maintaining a 0-2 pain level as you suggest, and I feel like I am able to slowly transition out of the boot. At this point, I am able to (in the boot) put more weight through the ball of my foot simply because the inflammation is a lot milder than it was 3 months ago. My main question is, as I transition into a stiff-soled shoe with orthotics, what are the primary signs to go back into the boot temporarily? Dr. Blake's comment: You have to maintain the 0-2 pain levels throughout. Look for patterns of what increases your pain and avoid for one month before retesting that benchmark again. As you transition from boot, you should ice twice daily whether or not you feel you need it, and contrast baths each evening. During this transition period and after the transition period, is it common to have the area swell up still? I just want to get a good idea of how much inflammation I am supposed to expect as I transition into walking normally, and then transition into jogging and running months down the road. Also, I want to say thanks for starting the blog, it looks like it has grown quite a bit and it is jam-packed with a ton of good information. I am making a donation for sure. I came across your blog while researching fractured sesamoids. Thanks for all the great information! I wanted to tell you about my experience and see if you had any additional insights int my condition or thoughts about my treatment thus far. I’m a 45 year old male and fairly active. I woke up in March with some pain and discomfort in my big toe. I wasn’t paying very close attention to it but my impression at the time was that I thought I had slept on it funny, maybe did something like hyperextend it in my sleep or slept with it bent back for a length of time that caused me to wake up sore. It wasn’t incredibly painful though, so I didn’t think too much of it. In fact, I sort of figured the best thing to do was to work and stretch the toe as I normally would. That day I did the orbital machine at the gym as well as some shadow boxing and weightlifting, all of which put pressure on the toe. Dr. Blake's comment: In some ways, this is a good sign. You did something in the presiding 3-4 days that the big toe did not like, but it took several awhile for the swelling to collect enough for it to hurt when you got up. The morning is the classic time to hurt since all night long when you are still, the swelling from an injury has time to settle into the tissues. The pain is for the inflammatory part of the pain. The injury happened without you noticing it a lot, so maybe a good sign!!?? Can you think back to these 3-4 days? Did anything stress the joint out of ordinary? I went to bed that night and maybe an hour or two after I fell asleep, I was awoken by excruciating pain. Throbbing, sensitivity etc.. I took some anti-inflammatories and iced it but could barely sleep. I hobbled to work the next day and taped my toe to restrict the movement of the joint for, what seemed to me, maybe some sort of turf toe but I did not see a doctor at that time. The taping helped and the pain subsided over the next few weeks. I was able to do yoga and box and was in a little discomfort but not bad pain. Dr. Blake's comment: Again, good sign!! Most joint flares, if arthritic, occur over 4 days to 2 weeks if you are treating the flare-ups. They can last longer if you choose to ignore or to select inadequate treatments. We do not know what you did, but this pain is still inflammatory and not the injury itself. Inflammation is the response of the body to heal. You are trying to heal something? Perhaps it is gout or arthritis? Have you had recent uric acid levels? 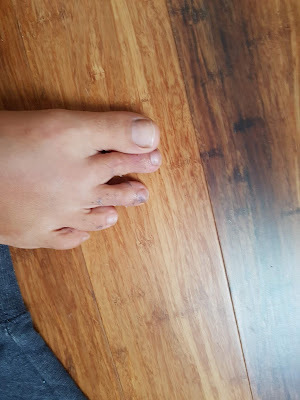 Maybe 5 or 6 weeks after that episode ( after 2 long intense bike rides which definitely put pressure on the toe and another intense workout) the toe pain came back and I was again having trouble walking. At this point, I found a podiatrist and went in for an appointment. He took an X-ray which didn’t show anything and said his hunch was that it was gout, but that he would send me for both a blood test and an MRI. I also was given a 5 or 6-day pack of prednisone anti-inflammatory steroid. Dr. Blake's comment: The thought was good. You do not want to take prednisone, even NSAIDs if you are suspicious for bone injury. Do not make this your way of handling bone/joint injuries in the future. The steroid cleared the pain up very quickly. I was hopping around barefoot and everything seemed good. The blood test came back before I could schedule an MRI and the uric acid read 8.1 which all seemed to point to a gout attack. Dr. Blake's comment: First, do you know what the range is of normal for this lab. Please send. Gout attacks can occur with high uric acid when trauma occurs. So, just because there was a possible gout attack, you still could have a stress fracture that caused inflammation that sparked the gout attack. A twofer!! When the course of prednisone was over, the pain came back with a little swelling. I was then able to get the MRI, which showed a comminuted fracture on the medial sesamoid. My podiatrist put me in a darco low top shoe with a few cutouts to isolate the sesamoid and told me I’d be in that shoe for 4 weeks. From everything I read that seemed optimistic and sure enough, I'm at the 5-week mark now and after an appointment yesterday, the doctor suggested 2 more weeks based on the fact that the area was sensitive to the touch yesterday. He says that progress is really just based on clinical diagnosis of comfort. The problem with that is, the more I try to give the area with attention, massaging and movement, the more sensitive it is after. Dr. Blake's comment: Here I will comment on the some of the images you sent me. First of all, when you use Prednisone, you should ice for 10 minutes three times a day after for the next 2 weeks. This helps to make the effects of the Prednisone last longer. When you push down, the sesamoid can push up against the first metatarsal causing injury. The arrow points to the darkened or inflamed first met head. This is a stress reaction, bone bruise, or stress fracture of the first metatarsal head. The stress fracture can actually heal much faster than the others!! This image shows that the bone edema of the first metatarsal head is the most significant injury, not the sesamoid. 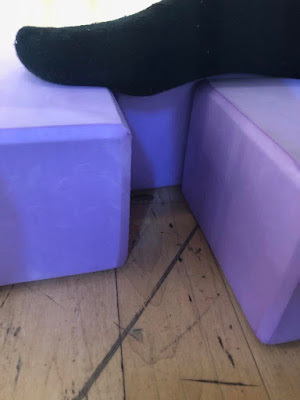 Dr. Blake's comment: As long as you have something with a dancer's pad to off weight the sesamoid area, various the stresses with stiff soled mountain bike shoes, anklizer removable boots, Hoka One One shoes, stiff hiking boots. You must maintain the pain at 0-2. You should spica tape and cluffy wedge. You should get an Exogen bone stimulator for the next 9 months for the first metatarsal, not the sesamoid. I still go to the gym but am doing the stationary bike in a way that puts no pressure on the upper foot or other exercises that do not involve the foot. When I'm home I’m barefoot but I walk on my heel and side of my foot and don't ever let the sesamoid hit the ground. I also got an exogen bone stim and am using that twice a day along with calcium supplements. 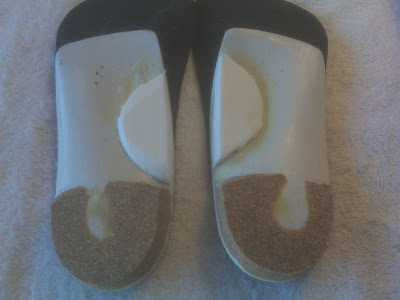 Dr. Blake's comment: At home, try the Oofos sandals as house slippers. Hopefully, you can put down more normal weight. It is okay to put a dancer's pad in the oofos. Get your Vit D levels. Any osteoporosis run in the family? Bone health may be the issue in any bone injury. Consider a bone density screen if your diet is irregular, or chronically low Vitamin D, etc. I’ve read about people in casts and much more restrictive boots for a fractured sesamoid. Is the darco shoe not conservative enough? I will say that I do not put pressure on the sesamoid nor do I flex the big toe when I’m walking. Dr. Blake's comment: You have to do whatever to create the most normal gait with a 0-2 pain level. I love also having three possibilities for shoe gear to alternate because you never really know if something is working if you are only trying one. See my comments above. The bike shoes and anklizer are both about $50 each (if you look around). Any insight or suggestions you have would be really appreciated! I'm a little unsure of my podiatrist's ability to provide nuanced advice based on what I’ve experienced thus far and if I don't get this healed properly I won't be able to work. I’m also unsure of his approach in taking additional x rays to monitor progress when an x-ray did not find the fracture in the first place. 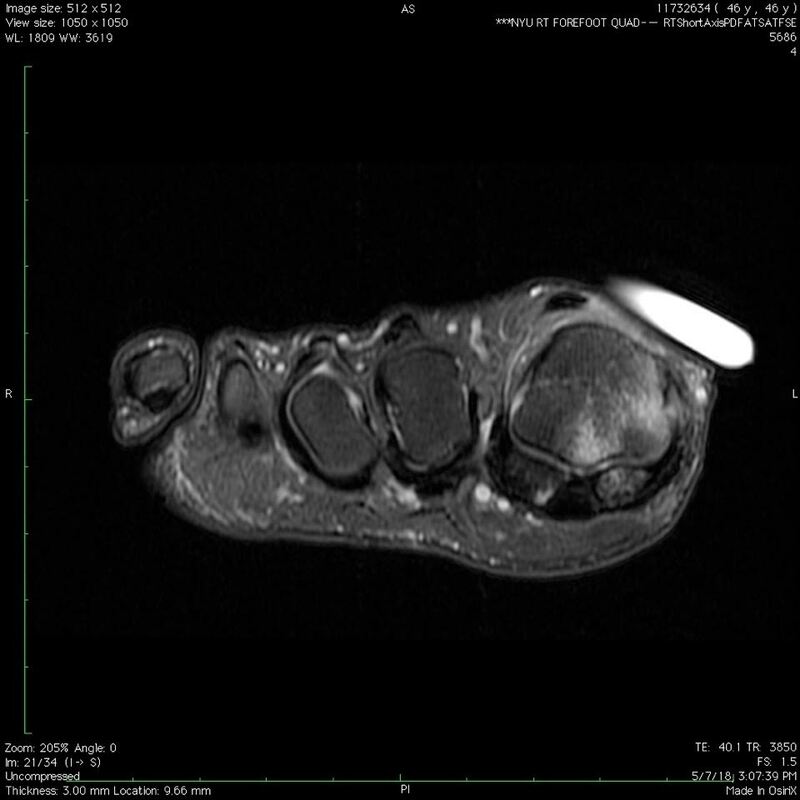 "There is nondisplaced probably comminuted fracture involving the medial sesamoid with associated diffuse bone marrow edema within the and focal edema within the articulating plantar metatarsal head. There is trace focal edema within the plantar aspect of the lateral/!fibular sesamoid. The intersesamoid ligament and bilateral sesamoid phalangeal ligaments are intact. There are thickening and heterogeneity with a linear increased T2 signal at the origin of the medial collateral ligament (series 6, image 11). The joint spaces and alignment are maintained. The articular surfaces are intact. There is no aggressive osseous destruction. There is no joint effusion or synovitis. Tendons: The visualized extensor/#exor tendons and ligaments are intact. Miscellaneous: Ill-de!ned soft tissue like signal intensity within the second intermetatarsal web space possibly represent small neuroma. Plantar plates are intact. There is no abnormal signal in the musculature to suggest atrophy or denervation. The subcutaneous tissues are unremarkable. " I can't recall anything specific that I did to the toe in the days immediately before the first symptoms but I suspect that I sometimes exert a lot of pressure on that toe area when I ride a bike so perhaps that is related. I had definitely ridden that week. I will be mindful of my technique in the future and perhaps get different shoes for riding. I do have a history of low vitamin D and had taken extra vitamin D in the past but not faithfully. in 2016 my vitamin D was 22.6 when normal range was described as 30-100. Clearly, a possible culprit here and I wish my primary physician had described the risks of low vitamin D. There is no history of osteoporosis that I know of. Dr. Blake's comment: This is such an epidemic, and at your age of 45, I would get the Vitamin D level, and a bone density test. These can change the course of treatment if abnormal. I think my podiatrist gave me prednisone because his initial thought was that it was gout. It seems like it was either was not gout or it was a secondary ( first time) gout attack brought on by the bone injury. The lab says that uric acid levels up to 8.5 falls in the normal range but elsewhere I've read that one should really keep them below 8.0. Mine was 8.1 at that time. The MRI was done about 11 days after my initial visit and 6 days after the prednisone schedule was over ( also about 7 weeks after the initial pain) and I was walking with some, but not major pain at that point. Dr. Blake's comment: In gout attacks, which can be brought on by trauma like breaking a bone, the uric acid levels in your bloodstream drop over 1 point. So, if you were 8.1 in a gout attack, you were really running at 9.1 to 9.6. The key now is to retake the uric acid one month later and see what is happening. If you are still 8.1 then you just run high, but if you are 8.7 or higher another gout attack is in the making. I realized I probably have a bipartite sesamoid but are you saying you don't see any fracture in the sesamoid? Dr. Blake's comment: From the views I see, there is evidence of bipartite, not fracture, although the bone is bruised. The main bone problem is in the first metatarsal head, and it treated the same as a broken sesamoid. It is the sesamoid pushing on the metatarsal that causes pain. This will take a while to heal. Here the tibial sesamoid lights up on T2 imaging meaning it is bruised. This is not the intensity of bone inflammation you typically see in a stress fracture. The uniqueness of this situation is the bone edema in the first metatarsal head signifying arthritis or stress fracture. The sesamoid pushes up right on the inflamed first metatarsal. I've been slightly altering where I line up the Exogen bone stimulator. Sometimes under the sesamoid pointing up and sometimes more on the side pointing toward the joint. Is there a specific place you’d recommend to address the metatarsal? Dr. Blake's comment: Since it has a 3 inch penetration, you can place on top of the metatarsal head and then walk around and multi-task. But, where you are putting it (bottom or side) is closer and either are fine. How do I know when I can start flexing the toe and pronating again? I dont want to inhibit the healing process or cause any further damage but am anxious to get everything working again in a way that wont make it worse. How will I know when I can put normal weight on the sesamoid without a pad? Dr. Blake's comment: This is the typical rehab question for any injury as we increase activity. It is important to make one change at a time, and probably one month apart is safe. Most athletes with this stay with the mechanical supports well into their athletes, and when they have leveled out the activity, start lessening the things that helped them get there. With sesamoid injuries, you can have cluffy wedges, spica taping, rocker shoes, orthotic devices, dancer's pads, etc. You have to stop one at a time in a logical order when you are doing all your activities and feel you are healed. I think/hope I am almost ready to segue out of the darco boot but how will I know for sure? I had bought some hoka one one bondis last week so I will start with them with a dancers pad. Dr. Blake's comment: This is how us rehab people find out what people need to move forward. What does it take to achieve a 0-2 pain level while we move the patient back towards a normal existence? If I had 100 patients at one time with the same injury, they would all be slightly different in their needs. There are general rules, but each individual has to be individualized. 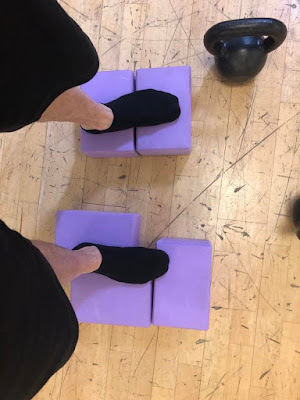 I went to the gym a few days ago and made a sesamoid relief platform so that I could work on my balance and address atrophy in other areas of my foot. It felt great and contrast baths helped with the swelling afterwards. Below are the pics of the ( very simple) workout platform and some additional MRI images just in case they show anything additional.